The MiG-35 is the best light fighter in its class in terms of its combined combat characteristics. Russian Aircraft Corporation MiG is set to manufacture around 100 MiG-35 fighters over the next few years, according to the Russian Ministry of Defence. The military department is planning to sign a contract for delivery of these fighters after 2016. The purchase of the new combat aircraft will enable “an optimum fleet correlation to be established between light and heavy fighters in the Russian Air Force,” according to a Ministry of Defence press release. According to a Lenta.ru source in the defence industry, delays in signing the contract to deliver the MiG-35 do not point to a refusal on the part of the military to purchase this aircraft. The final decision on whether the military will acquire the new aircraft has already been made it is simply a question of finding an optimum time to sign the contract. 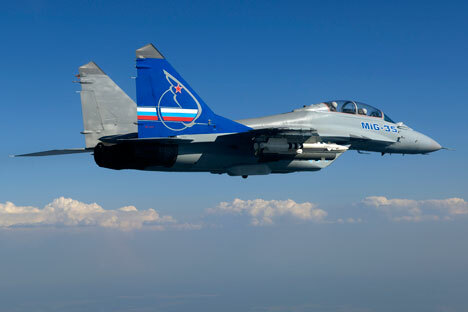 The Ministry of Defence reached agreement with MiG on the delivery of 16 MiG-29SMT fighters. The acquisition of the MiG-29SMT cost the military around $474 million. This price covers delivery of all ground and monitoring equipment. The acquisition of this aircraft technology is being carried out as part of a programme to develop Russia’s Armed Forces by 2020. In accordance with this programme the existing aircraft and helicopter fleets will be almost completely updated. With this in mind provision has been made for acquisition of more than 600 aircraft: the Su-34, Su-35S, PAK FA, MiG-35S, the future Su-25SM ground attack aircraft, the An-70, Il-76MD-90A military transport aircraft, as well as around 1,000 helicopters for a variety of roles: the Mi-26, Mi-8MVT-5, Mi-8MTSh, Ka-52, and Mi-28NM. The MiG-35 is based on the MiG-29 and is almost identical to it externally. However internally it could be considered close to a fifth generation aircraft. The MiG-35 is capable of carrying advanced aerial strike threats. It enjoys super manoeuvrability on account of its powerful engines with vectored thrust technology. One of the main idiosyncrasies of this aircraft is the RLS ‘Zhuk-A’ – Radar System, with an active phased antenna array. This radar system allows the aircraft to work in ‘air-to-air’ and ‘air-to-ground’ modes simultaneously, and to identify and classify individual and collective aerial targets at a range of 150 km, while for maritime targets the range is 250 km. The MiG-35 is able to track 30 targets and attack 8 simultaneously. In terms of its combined combat characteristics, manoeuvrability, and its immunity from missile attack the MiG-35 is the best fighter in the world of all the available aircraft in its class. As far as cost and quality considerations are concerned, to all appearances it even trumps the American JSF-35 fifth generation fighter. In the opinion of Vice-Premier Dmitri Rogozin, the MiG-35 could become a stepping-stone on the road to a new light fighter. Such an aircraft would be able to successfully supplement the heavy PAK FA fighter and see success on the export market. Head of the United Aircraft Corporation Mikhail Pogosyan also confirmed that Russia needs a light, single-engine fighter, however its development is a matter for the future. The order from the Ministry of Defence for such a large number of aircraft should serve to promote MiG-35 sales more actively on overseas markets. “If the state is procuring these aircraft, then customers will more readily sign contracts with the manufacturers supplying military technology to their own armed forces, on the understanding that this guarantees operational support for these products,” said General Director of MiG Sergey Korotkov. At present the export prospects for the MiG-35 are very slim. Pilots in 29 countries around the world are flying MiG aircraft of various types, however at present the MiG-35 is produced for India alone. According to Korotkov, India is acquiring MiG-29K aircraft for her navy. The MiG-29K is a carrier-based version of the MiG-35. Based on articles published by RIA Novosti, Rossiyskaya Gazeta and Lenta.ru.